During this month of April  I went on a visit to the residence of Mr. Joseph Knight, of Colesville, Broom co. N. Y., with whom and his family I had been previously acquainted, and of whose name I have above mentioned as having been so kind and thoughtful towards us, while translating the Book of Mormon. Mr. Knight and his family were Universalists, but were willing to reason with me upon my religious views, and were as usual friendly and hospitable. We held several meetings in the neighborhood, we had many friends, and some enemies. Our meetings were well attended, and many began to pray fervently to Almighty God, that he would give them wisdom to understand the truth. 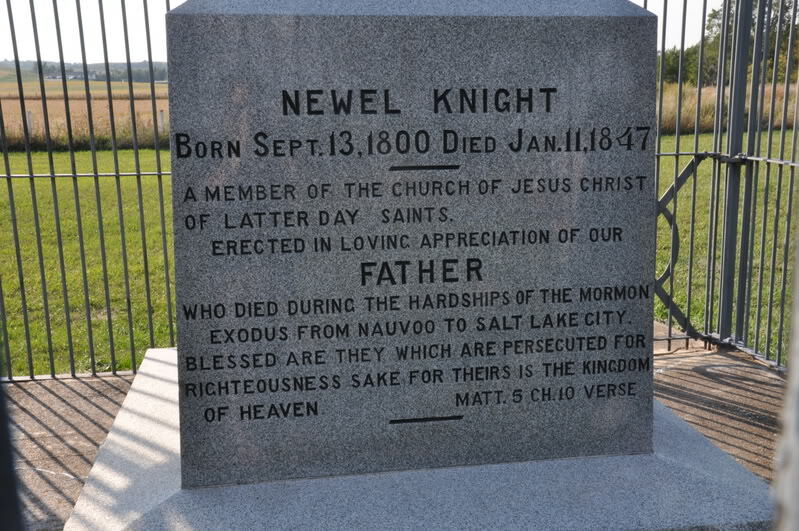 Amongst those who attended our meetings regularly, was Newel Knight son to Joseph Knight. He and I had many and serious conversations on the important subject of man’s eternal salvation: we had got into the habit of praying much at our meetings and Newel had said that he would try and take up his cross, and pray vocally during meeting; but when we again met together he rather excused himself; I tried to prevail upon him making use of the figure, supposing that he should get into a mudhole would he not try to help himself out? and that we were willing now to help him out of the mudhole, he replied that provided he had got into a mudhole through carelessness, he would rather wait and get out himself, than have others to help him, and so he would wait until he should get into the woods by himself, and there he would pray. Accordingly he deferred praying until next morning, when he retired into the woods; where (according to his own account afterwards) he made several attempts to pray but could scarcely do so, feeling that he had not done his duty, but that he should have prayed in the presence of others. He began to feel uneasy, and continued to feel worse both in mind and body, until upon reaching his own house, his appearance was such as to alarm his wife very much. He requested her to go and bring me to him. I went and found him suffering very much in his mind, and his body acted upon in a very strange manner. His visage and limbs distorted and twisted in every shape and appearance possible to imagine; and finally he was caught up off the floor of the apartment and tossed about most fearfully. His situation was soon made known to his neighbors and relatives, and in a short time as many as eight or nine grown persons had got together to witness the scene. After he had thus suffered for a time, I succeeded in getting hold of him by the hand, when almost immediately he spoke to me, and with great earnestness requested of me, that I should cast the devil out of him, saying that he knew he was in him, and that he also knew that I could cast him out. I replied “if you know that I can it shall be done,” and then almost unconsciously I rebuked the devil; and commanded him in the name of Jesus Christ to depart from him; when immediately Newel spoke out and said that he saw the devil leave him and vanish from his sight. This was the first miracle which was done in this church or by any member of it, and it was done not by man nor by the power of man, but it was done by God, and by the power of godliness: therefore let the honor and the praise, the dominion and the glory be ascribed to the Father, Son, and Holy Spirit for ever and ever Amen. This entry was posted in Agency, Church History, Evidences, Faith, Jesus Christ, Leadership, Prophets, Protection, Satan, Stories from Church History and tagged 1830, Miracles, New York, Newel Knight, priesthood, priesthood power, Satan. Bookmark the permalink.